Shopping online for t-shirts is a new trend. Instead of having to go to the mall or nearby clothing store, all you need to do is visit your favorite website and browse through an extensive catalog of items. And one of the best t-shirt online stores is Threadless; founded in 2000, its designs are created by and chosen by an online community. It started as a t-shirt company but has now expanded into a lineup of apparel, footwear, and accessories, available for men, women, and kids. At the website, you will find everything organized into categories, but the Collections one is the most visited. It groups many similar designs into themes, so if you are looking for a shirt with a cat design, there are over 200 to choose from. No matter what your interest is, there will probably be a t-shirt here you will like. Unicorns, zombies, superheroes, wolves, and even pizza are some examples. When you visit this online t-shirt website make sure to check for any discount coupons, which are regularly posted on the homepage. If you’d like to check out other designs, there are lots of t-shirt online stores like Threadless you can visit. These are some of the best Threadless alternatives we found. CafePress is the site to go for celebrating your unique identity and passions with custom posters, coffee mugs, stickers, and t-shirts. What we love about this website like Threadless is that not only can you buy a fantastic t-shirt for men, women, kids, babies, and toddlers, but also for your best four-legged friend! From a small size, perfect for a Chihuahua, to an XXL that will make your Saint Bernard look fashionable and in style, there are plenty of designs for both male and female dogs. 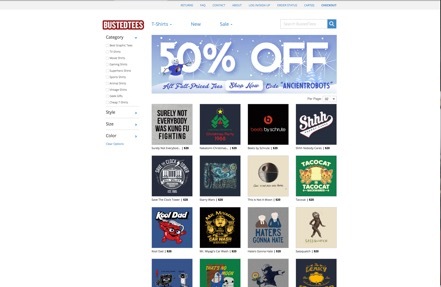 Another feature that makes this one of the best t-shirt online stores like Threadless is their customization option. 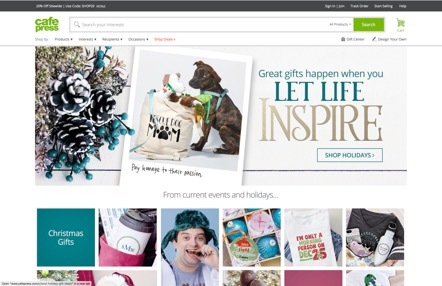 If you have a specific design in mind, click on the Design Your Own link and use the online designer tool to create and personalize your product. With this, you can make custom t-shirts, personalized drinkware, and design custom baby clothing, stationery, car and truck accessories, and much more. Once you are done, place an order and have your work sent to you in a few days. Need a large variety of t-shirt designs? How about 25,000 of them? That’s what you will find at this Threadless alternative. And once you see the model you want, you can choose between many different items to print it on. For example, Tshirts are available in a classic round neck, or a trendy V-neck, with sizes from baby to adult, all the way up to 3XL. Need a different item? Print the design on a hoodie, mesh cap, tank top, cooking apron, mouse pad, and dozens of other products. But if customization is what you want, you have it here also. Upload your design and print it on any item, from polo shirts and tank tops to pillowcases or tote bags. Shirtcity has over 15 years of experience, offers quick delivery, and has a support team which you can contact in English, German, and Dutch. Shop graphic tees selected by a community of creative designers. Over 15,000 international artists feature their designs at this website. There are also design contests held where people involved in Diablo 3, The Dark Night Rises, and Wacom have participated. 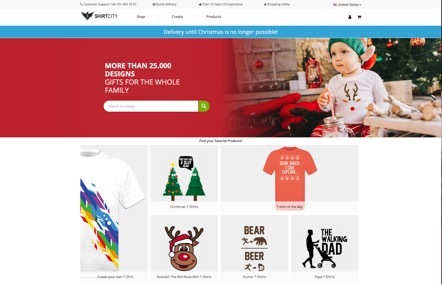 What makes this a great online t-shirt site like Threadless are the high appreciation for all things creative and the brilliantly designed tees. Unlike many Threadless alternatives that only have some basic designs, here you can find officially licensed apparel. 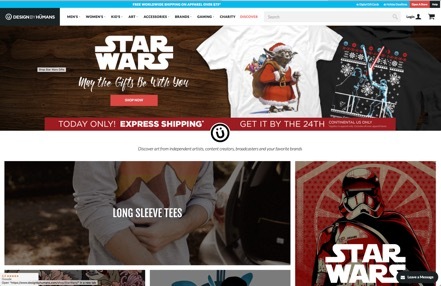 For example, there is a large selection of exclusive Star Wars t-shirts, where you can find a shirt with a Blue Millennium Falcon, the Rebel Alliance logo, or even Santa Yoda, perfect for the holiday season. Marvel, Disney, Pixar, and Cuphead are some other brands you can find here. 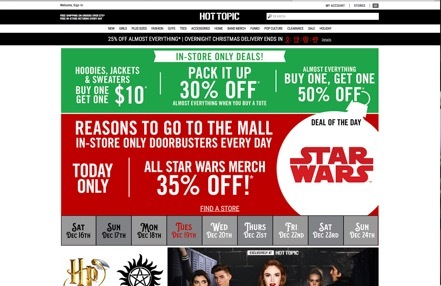 Hot Topic is an online t-shirt store similar to Threadless that specializes in music and pop culture inspired fashion, accessories, and licensed music. It is the site to go to if you need t-shirts and merch from the bands you love. There are many categories to check out, like animal, gamer, music and humor tees, and most are available in sizes from XS to 3X. We liked this site because it was a place where we could buy not only a fashionable t-shirt, but also socks, underwear, pajamas, and jeans, all in one single place. Here is a t-shirt online store like Threadless that cares about what you wear. 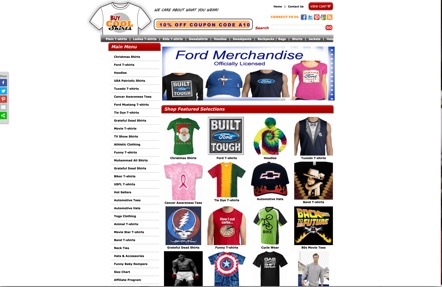 T-shirts are the main item, and you have dozens of categories to choose from. Movies, Funny, Patriotic and TV show are some examples. But if you want other apparel there is plenty to choose from: sweatshirts, hoodies, sweatpants, shorts, and jackets are also available. You’ll find well- known brands like Champion, Bella, Anvil, and Fruit of the Loom, which guarantees high-quality and comfort. Every item you buy is guaranteed to be delivered in perfect condition. If for any reason you are not satisfied with your purchase, contact customer support and they will make sure your problem is resolved to your complete satisfaction. Look for any discount coupons posted on the site and receive a significant discount on your order! This Threadless alternative has been selling hip t-shirts online since 2004. Many designs are sourced from comedians and brands like Funny or Die, CollegeHumor, Saturday Night Live, and Conan O’Brien, and they are printed on t-shirts and hoodies. When you buy something here, you are buying quality; each item is made from excellent materials like 100% cotton blanks, tri-blends, and 50-50’s. To narrow down the results you can sort the t-shirts by style, size, and color, and there are a few categories that can also help you filter out the options. Visit the new page to check out the most recent designs that have been added to the site and place your order with confidence. Although the prices are already very affordable, if you want a great deal order a Mystery Tee: just pick your size, and a random BustedTee shirt will be sent to you.